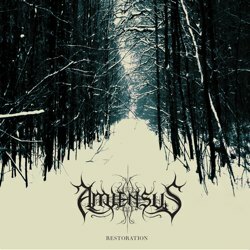 Amiensus is a new atmospheric progressive black metal bad from Minnesota USA. They were founded in 2010 by members of various other bands (The Last, Minos, Dread Veil) taking their name from the Amiens Cathedral located in France! The same year they released the EP “The Last EP“, covering mostly songs written by members of The Last. The band’s debut full-length album “Restoration” was initially released digitally on Bandcamp, later on tape limited to 30 copies, until finally Pest Productions released in on CD in October 2013. The band was formed with the intention to play whatever they wanted with no genre restrictions at all. Thankfully their music is much less “chaotic” than what the above sentence might imply. The band has its roots on atmospheric melodic black metal, is deeply influenced by progressive metal and is experimenting with post rock, acoustic folk, avant-garde and ambient elements and aesthetics. Beautiful, technical and melodic guitars, excellent symphonic, yet discreet synths, solid drums, atmospheric acoustic guitars and few violins, are combined with expressive black metal screams, touching and emotional clean male vocals and few guest female vocals. The band has done a perfect job, moving between various styles and being surprisingly good in every single one of them! The total duration of the album is a little over 46 minutes, including 8 songs plus a new version of the track “Prometheus” from their first EP as bonus track. Amiensus have a mature sound with great production and they all seem very skilled musicians. Despite its complex and ever-changing compositions, “Restoration” is a very melodic album with unique atmosphere. The band has beautiful lyrics with a poetic philosophical melancholic mood. “Restoration” is a great work, totally recommended if you are into atmospheric progressive experimental black metal. In November 2013 Amiensus released the 2-track split EP “The Gathering” with Oak Pantheon and they are currently working on their next album, so they are here to stay! The Chinese label Pest Productions released “Restoration” in a beautiful 8-panel digipak CD, limited to 500 copies. The digipak includes the lyrics, while its photography is by Levi Avery and design by Zack Morgenthaler. You better visit their pages in the links below and listen to their music, since their complete discography is available in their official Bandcamp profile.